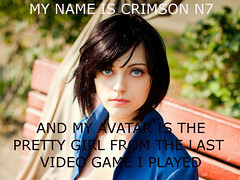 Inspired by CrimsonN7's ME 3 MP Thread. And by "inspired," I mean blatantly stolen! PuG is Pick-up Game, originally. I believe it comes from street basketball/street hockey and other such gatherings. It basically means that you just grab all the nearest players and start the game. In the world of online gaming, and in the world of ME 3 MP, in particular, PuG has also come to mean "Pick-up Gamer," or one of those nearest players that you just grab for the game, i.e. it basically means any random gamer that you just meet and immediately jump into a game with. Personally, it's been a while since I played an MP game as a complete beginner. Even after a six-month break, I still have a solid handle on ME 3 MP's higher difficulties, but DAMP is going to be my first "fish out of water" MP experience in almost 2 years. I'm sort of looking forward to being a newb carried by random strangers online, again. Hehehe, let the games begin Soon™! I love how this thread got started a whole month before the game comes out. Now, we just need a "Those BSNers that you happen to bump into" thread. I died about a hundred times. Then we finally made it to the dungeon entrance and had a server disconnect. Or I think that's what it was. We're going to also need a "Things PuGs say..." thread too. Scrubs. Scrubs everywhere. Calling it now. They all got sync killed by red templar lords. lol Then all my decoys were gone. Me and Slowerthanashenjeremiahmassmegabeast are going to do a duo later. I might take a whirl on perilous hazard later on with a butter knife. I'll record it and stick it up on youtube.